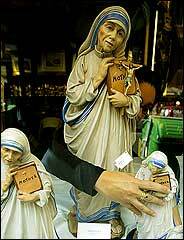 In Rome, the Selling of "Blessed Mother Teresa"
There is NO chance the woman was even SAVED. She was a child of the devil, by her OWN testimony. She told a Nashville man to his face, at her convent in India, “WE ARE SAVED BY MARY” before storming off. No one who believes that can go to Heaven, no matter what their reported “good deeds” may be.